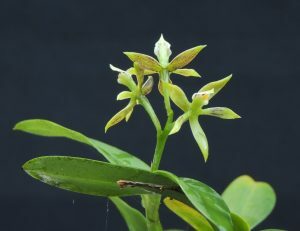 This is a first appearance in 365 days for one of the smaller growing of our prosthechea species. This species is native to Brazil where it grows in the coastal forests of the Mata Atlantica. We have seen similar species in Brazil clothing the thick lower branches of trees and this species has a spreading habit with its little sprays of non-resupinate (upside down) flowers clear of the leaves for passing pollinators which would be butterflies. We have tried the species in several sections of the greenhouse as we have found very little information about it and find that it prefers to grow warm and shaded with the free draining conditions provided by a basket.